A quaint space that’s dedicated to everything kid’s need from clothes to toys, Aomi is what Apple Of My I, on 12th Main, Indiranagar used to be. Except this is smaller, but adorable. They also have a cute activity space for workshops for kids and their parents. If you are coming with your kid, be sure to hold onto them tightly or you will end up with a kid trying to grab everything on the shelves at Aomi, by Apple Of My I. That’s the kind of effect the store has on kids, and with us too. We found ourselves wishing we were kids just so we could pick up a couple of pop-up storybooks and a few plush toys or puzzles from the rack. Or probably go mad trying out mini tuxedos or bubblegum pink or baby blue frilly dresses. The store caters to everything that a newborn baby to a five-year-old would need. That means feeding bottles to wooden puzzles that are definitely child-proof and child-friendly. Those looking for prams, strollers, and car seats can find a limited collection at the store. If the little one you’re shopping for is a play-school going kid, there’s lunch boxes, bottles, lunch box bags, and child-proof cutlery to pick up. These are all in colourful designs that kids will love showing off. We definitely wanted to pick ourselves a cute penguin-shaped lunch box bag. Children’s literature consists of pop-up story books, bedtime stories collection, classics, and picture books. 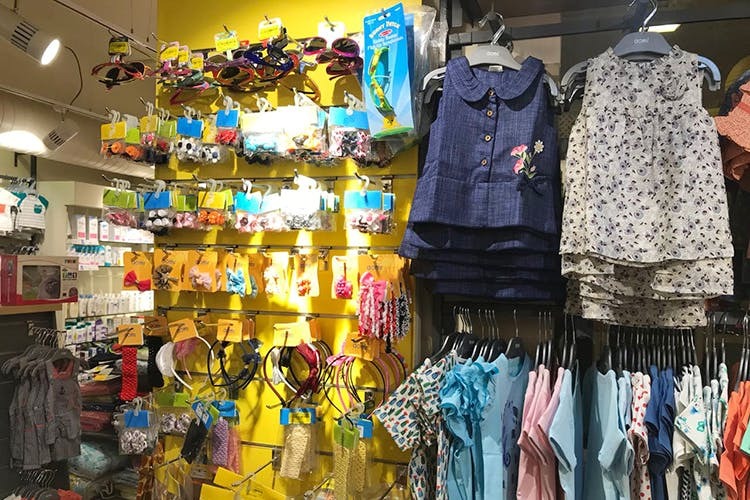 The store’s got an extensive collection of clothes for ages zero to five and you will find everything from a party dress for a birthday party, simple tees and tops in bright colours and with doodles and animal designs on them. There’s even ethnic wear for girls. For the boys, there’s trousers, vests, waistcoats, shirts, shorts, and tees. They also stock footwear, but mainly for the girls. Think cute and pretty pumps in shades of red, pink, and cream. What we really love here is that they treat kids like kids. None of the over-the-top outfits that make children seem like they are adults. Chic, smart, pretty, cute and ideal for young ones, parents, no need to worry about excessive stuff here. Apart from all this, the store’s also has a small activity space where they regularly conduct workshops and camps for kids of all ages. These workshops and camps could see the kids take part in dancing, puppet making, singing, and plenty of art and craft. What better way to spend the day with your young ones, right? Be sure to check with the store as to when their next session is.